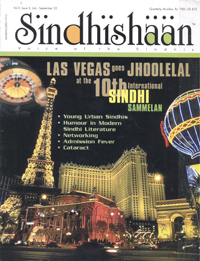 ‘Man – your community has sure livened up the place – they really know how to enjoy life’ said the bartender, passing me a chilled glass of beer on a hot Saturday afternoon at the Alexis Park Resort Hotel bar in Vegas where I’d gone to attend the 10th International Sindhi Sammelan. His words got me thinking. As a matter of fact I was feeling a little embarrassed at the loud behaviour of a group of elderly Sindhis – men and women – drinking Margaritas and Blood Marys, laughging in gay abandon at jokes which I’m unable to print and making plans for the afternoon outing to a nearby casino. WHY NOT? I said to myself. After all they are part of the community that had to start life from scratch after 1947 and if they’ve managed to reach a certain stage in life where they can enjoy the fruits of their hard work and countless sacrifices – who am I to grudge them these worldly pleasures so painfully earned. In fact I began to get carried away with their “spirit of bonhomie” and “joi de vivre” and zest for life. If you have it why not enjoy it and let your hair down once in a way instead of carrying on with a serious countenance to present to the world. I am now viewing my community from a different perspective. They work hard and they play hard. A trait we admire in others who have made a success of their lives. I can now appreciate their aggressiveness in trying to grab seats in the first tow in an auditorium, squeezing into camera frames with celebrities, making their presence felt at gatherings, etc. These are all intuitive characteristics for survival and a passion to succeed. These tendencies exist in other communities as well. Who doesn’t want to be photographed with celebrities or to be feature on page 3? But unlike the others who may secretly pay the media for gaining limelight, the Sindhis are frank and hones and make no bones about what they want. And they deserve every bit of what they have earned. Can anyone show me a Sindhi beggar! At the same time try conning a Sindhi to part with even 10 rupees – I bet you won’t succeed. At the same time there is no dearth of philanthropists within the Sindhi community. Tell me where can you find such a perfect balanced blend of humanity? So let the SINDHI MAKE HIS STATEMENT IN HIS OWN STYLE.